Depending on the weather gods, New Zealand’s ski season generally kicks in by July. But even if you’re not a skier, you just can’t beat that snowy scenery for capturing beautiful photos or simply taking in the views. Winter heralds the rugby season and this year, the Lions are touring through seven cities in New Zealand. But even if you can’t make it to one of the big games, you’ll undoubtedly come across a provincial game of rugby being played somewhere on your travels, and you just can’t beat grass roots rugby. Make the most of the quieter roads and the deserted beaches and parks. While it can be impossible to find a freedom camping spot in summer, in winter, you’ll most likely have your pick. Park up, stay warm and dry, and enjoy the peace and quiet of your favourite beach or park in the winter. 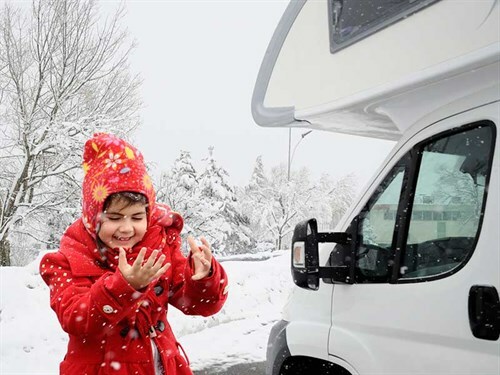 A roaring fire, hot chocolate and marshmallows, hearty soup, fleecy boots, and a cosy motorhome… they’re just not the same in summer! Embrace the cooler, darker days by enjoying your favourite winter goodies in a snug, warm motorhome. You’ve spent all summer walking, cycling, or just being active, so why give it up because it’s cooler? It’s hard to feel motivated to be active when you’re rugged up at home, but when you’re motorhoming, there’s so much to discover, which makes it easier to keep active and fit. The Southern Lights (Aurora Australis) appear from just over the southern horizon in Dunedin. Statistically, the best time of year to view them is around the equinoxes of March and September, however, June and July are also good months as the sky is darkest then, making any aurora activity easier and more dramatic to observe.